2011년 수도권의 사업체는 약 147만 개, 종사자 수는 약 765만 명이다. 수도권의 3차 산업은 전국 대비4 7.8%, 종사자는 전국 대비 53.1%를 차지하고 있다. 수도권의 3차 산업 사업체와 종사자 수는 지속적으로 증가하고 있고 특히 경기도에서 그 증가폭이 크게 나타난다. 2011년 현재 수도권 3차 산업 종사자 수는 서울 4,215,977명, 인천 620,185명, 경기도 2,810,202명이다. As of 2011, there are 1.47 million establishments in the tertiary industries in the metropolitan area, employing 7.65 million people. They account for 47.8% of the establishments and 53.1% of the employments from this industry in Korea. The number of establishments and workers is steadily increasing, with expedited growth in Gyeonggi-do. 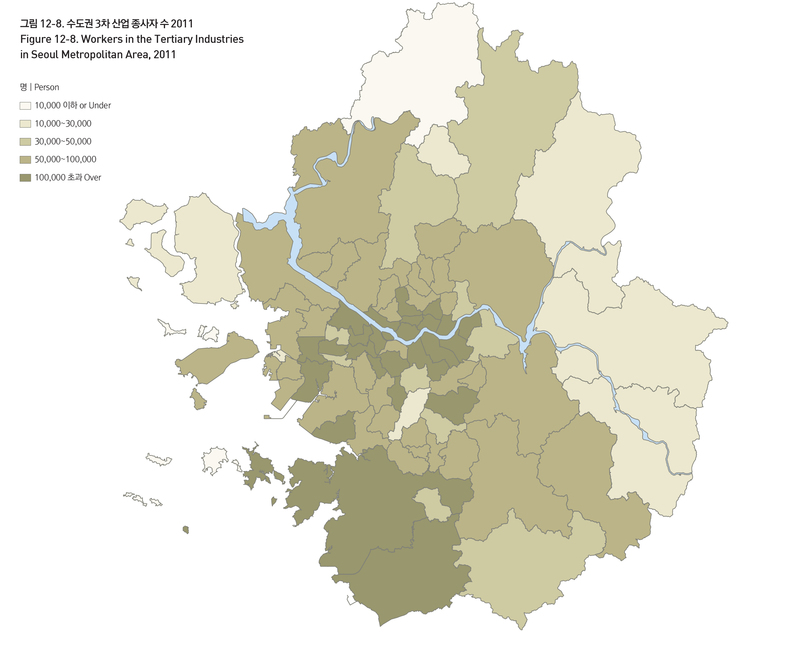 The number of workers in the tertiary industries in the metropolitan area can be broken down into 4,215,977 people in Seoul, 620,185 in Incheon, and 2,810,202 in Gyeonggi-do.